“Cobdown Hockey Club regularly plays its home matches on the Hundred of Hoo School Astro Pitch on Saturdays, usually from 12.30 onwards and from September till the following April.The club presently runs two mens teams and a ladies team and each plays within leagues throughout the season. We are a really friendly club and enjoy our hockey, even when we are losing although wins always lift the spirits! We arrange social activities throughout the season (boule tournament, ten-pin bowling, dinners and rounders) and even organise a Kent based 7-aside tournament in May. We are hoping to expand our membership so we can run more teams for players to gain extra enjoyment from their endeavours. So if you are fit, want to become fit, have played hockey before, have played another sport but would like to try hockey,have not played hockey before but have a good eye and feel for sport, are over 14 years old (We have a Youth Protection Officer and follow the English Hockey Association guidelines on young players) and want a social activity please consider joining our club. We welcome beginners and have fortnightly training sessions so you become acclimatised to playing before facing “opposition”. We provide some of your kit and will always encourage you, even when errors are being made, as we feel it is better to play well as a team rather than as individuals. We have our trials on Saturday the 10th September, from 1pm so hope you can pop along to watch and discuss. We recommend you viewing our website – www.cobdown.co.uk for further information or contact our Club Captain Karen Chapman via email on kchapman@blueyonder.co.uk or phone 07949 094461. 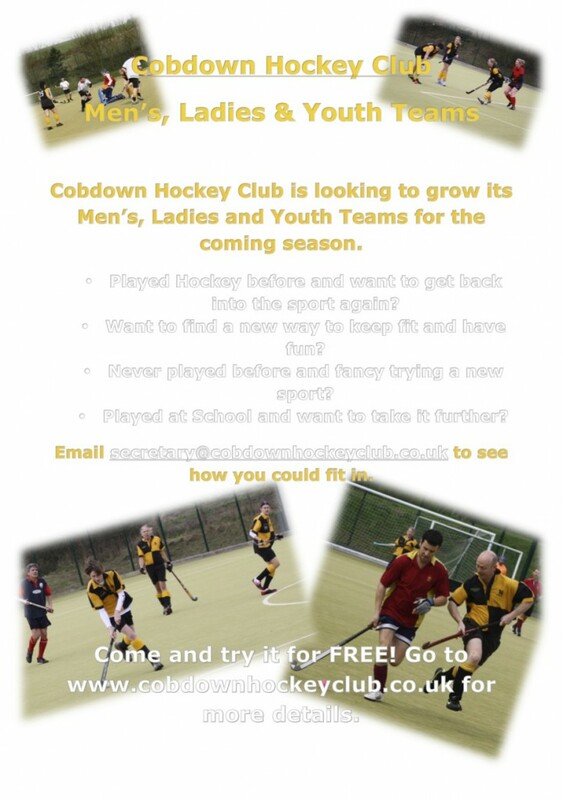 This entry was posted in Blog and tagged Cobdown Hockey. Bookmark the permalink.